Once the centre of the New York bohemia, Greenwich Village is now home to lux restaurants, and buzzer door clothing stores catering to the nouveau riche. 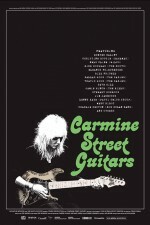 But one shop in the heart of the Village remains resilient to the encroaching gentrification: Carmine Street Guitars. There, custom guitar maker Rick Kelly and his young apprentice Cindy Hulej, build handcrafted guitars out of reclaimed wood from old hotels, bars, churches and other local buildings. Nothing looks or sounds quite like a Rick Kelly guitar, which is the reason they are embraced by the likes of Bob Dylan, Lou Reed, Patti Smith, Jim Jarmusch, just to name a few. Carmine Street Guitars features a cast of prominent musicians and artists, the film captures five days in the life of Carmine Street Guitars, while examining an all-too-quickly vanishing way of life.